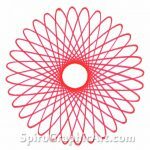 How can you predict how many points (or “petals”) a spirograph pattern will have? There IS a formula. You need to know the number of teeth on the wheel and the number of teeth on the ring. The number of points (N) is equal to the Least Common Multiple (LCM) of the number of teeth on the ring (R) and the number of teeth on the wheel (W), divided by the number of teeth on the wheel. In a spreadsheet, you would use “= LCM(R,W)/W”. Replace R and W with the coordinates of the respective cells. Using the set of prime numbers from each set with the highest exponent value we take 25 * 32 * 51 = 1440, which is the LCM. Divide the LCM by the wheel, so 1440/45 = 32, the number of points in the design above. Find a table of Spirograph Point Numbers here. There were two Super Spirograph arrangements with a very awkward gearing – the trapezoid and the open-end arrangement, with 268 points. As a result, all the rpatterns obtained were very dense, and none had fewer than 67 points. Other (inside) points numbers for Super Spirograph arrangements: Large square and diamond, 320; large triangle, 264; cloverleaf, 336; rectangle (4 x ‘E’ + 2 x ‘F’), 288. Thanks Mark, you’re a step ahead of me, and this saves me some calculating. 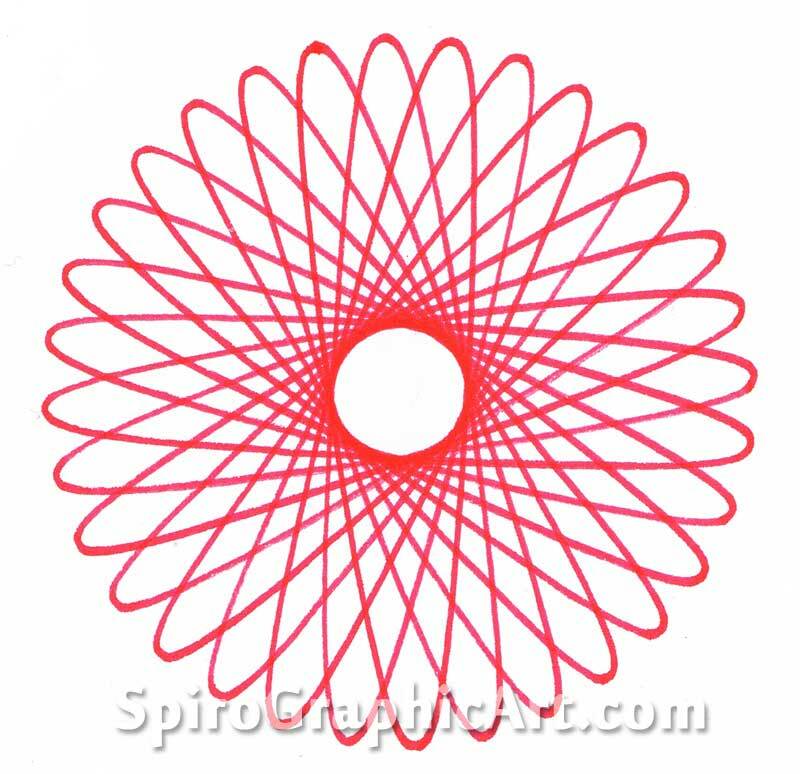 I plan to make a chart for the Super Spirograph arrangements with point numbers, like this one: http://spirographicart.com/table-spirograph-points/ but with illustrations. There are 4 wheels that give a LCM of 7 when used in ring 105. If you have a Spirograph, draw the patterns and feel the difference between them; if not, trace them with your eyes and you’ll see that they follow different paths to arrive at a 7-pointed figure. If Spirograph had a 15-toothed wheel (it would be too tiny), it would trace a heptagon with no lines crossing. Wheel 30 (the outer green lines) skips one point as it goes around. Wheel 45 (the blue lines) skips two points. Wheel 60 (red) skips over 3 points and Wheel 75 (inner green) skips over 4 – or maybe you could say it goes -2 in the other direction. If we had a 90-tooth wheel, it would make a tightly looped pattern, rather like wheel 84 in the other ring of 144/96, except with 7 points. Another way of calculating the points in the pattern is to treat the ratio of (moving : fixed) as a fraction. Wheel 60 in ring 96 would give 60/96. Cancel the fraction down to lowest terms and you get 5/8. The bottom line of the reduced fraction will be the number of points in the pattern. So 52/105 cannot cancel, which is why that combo has the full 105 points. Well that’s a lot easier. I’ll try that.